The Connaught Health & Fitness Club is currently CLOSED for refurbishment. A new fully equipped state of the art gymnasium, designed for able and disabled members will reopen soon. More details to follow. 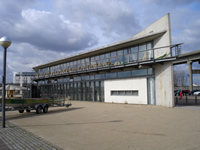 The gym will be located within the London Regatta centre on the side of Royal Albert Dock in London’s docklands, it is easily accessible by Docklands Light Railway (DLR – Royal Albert) or by Car with ample free secure parking. No Peak hours – use your gym anytime! More details and prices coming soon. Enquire at the desk for for your corporate rate. We are here to help you improve your fitness level.The sooner you start the better and fitter you will feel. Don’t delay and join today. Q:Is there parking at the Gym? A:Yes... free parking for members. Where is Re Opening soon - london regatta centre gym in London?